The Strait the Pacific and the Arctic oceans and separates the North American and Eurasian continents. Many experts are of the opinion that approximately 30 000 years ago there was an isthmus in the Bering strait in the Bering Strait area and people travelled over it to the North America. Semyen Dezhnev and Fyedot Popov, Russian kozaks, were the first, who sailed via the Bering Strait in 1646 on their route from Kolyma to the east. In 1728 Witus Bering, a great navigator and explorer, entered the Strait on the ship "St. Gabriel" from the Pacific ocean. In fifty years James Cook, another famous navigator, sailed in the strait, separating Asia and America, and named it the Bering Strait. In 1815 Otto Kotzebu, a lieutenant of the Russian Fleet, sailed in this area. He gave the current names to Diomede islands, situated in the Strait and discovered by Witus Bering. Bid Diomede turned out to be Ratmanov island and Little Diomede island was named as Kruzenshtern island. In 1867 Russia had sold Alaska to America and from this time the state border passes in the middle of the Bering Strait. In 1938 the USSR and the USA asserted the procedures regulating visits of the local citizens of Alaska to Russia. During the Second World War 7308 American airplanes carried out flights from the territory of America to the Western frontier via Alaska and the Soviet Far East. In 1948 the USSR notified the USA about the nullification of the agreement of 1938 concerning visits of citizens of Alaska to Chukotka. From 1948 to 1987 (the epoch of the Cold War) the border remained practically closed. In 1987 and 1988 the diplomatic, trade and cultural contacts were renewed. A powerful incentive to this process was given in 1989 when the Soviet-American expedition of Dmitry Shparo and Paul Schurke by ski and dog-sleds travelled along the "closed" settlements of Chukotka and the "closed" settlements of Alaska. According to the public opinion this expedition "had opened" the doors from one country to another and the participants received the letters of greetings from Michael Gorbachev, President of Russia and George Bush, President of the USA. Just after the expedition the governments of the USSR and the USA came to the agreement about mutual visa-free visits of local citizens. The team consisted of twelve participants: six from Russia and six from the USA. Among them there were four Eskimo and two Chukchi, they represented the aboriginal nations of the North. 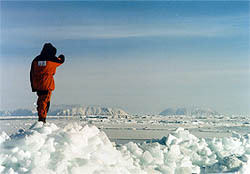 The expedition could not cross the Bering Strait by ski as the storm, which lasted twelve days, had scattered ice. From Chukotka the explorers sailed on an Eskimo kayak to Ratmanov island and then by ski to the Kruzenshtern, and, at last, they took a flight to Wales – the most western settlement of the North America. In 1993 Dmitry Shparo – the leader of the Russian-Canadian-Lithuanian expedition on snowmobiles along Chukotka and Alaska. 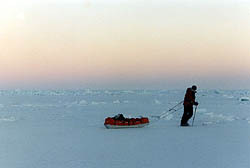 Matvey Shparo was the participant of this expedition. Persistent attempts to cross the Bering Strait were unsuccessful. The participants used a helicopter for the first part of their route, then by snowmobiles they reached the Kruzenshtern island and by aeroplane arrived in Wales. After passing 500 km along Chukotka the team had added 2 000 km travelling along Alaska (including the Yukon river) and reached Fairbanks.